Apple has quietly released a new iPod Shuffle design that mimics the original's pack of gum aesthetics. It costs $80, holds 4GB of songs, uses inline controls and boasts text-to-speech. So what do you think? Is this design better than the last iPod Shuffle? Personally, I really dislike that the new form costs users 2 hours of battery life. 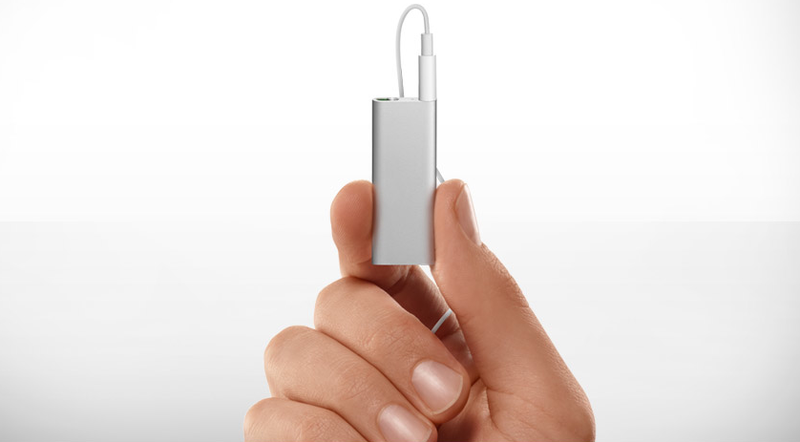 CUPERTINO, Calif., March 11 /PRNewswire-FirstCall/ — Apple® today introduced the all-new iPod® shuffle, the world's smallest music player at nearly half of the size of the previous model, and the first music player that talks to you. The revolutionary new VoiceOver feature enables iPod shuffle to speak your song titles, artists and playlist names. The third generation iPod shuffle is significantly smaller than a AA battery, holds up to 1,000 songs and is easier to use with all of the controls conveniently located on the earphone cord. With the press of a button, you can play, pause, adjust volume, switch playlists and hear the name of the song and artist. iPod shuffle features a gorgeous new aluminum design with a built-in stainless steel clip that makes it ultra-wearable. "Imagine your music player talking to you, telling you your song titles, artists and playlist names," said Greg Joswiak, Apple's vice president of iPod and iPhone™ Product Marketing. "The amazingly small new iPod shuffle takes a revolutionary approach to how you listen to your music by talking to you, also making it the first iPod shuffle with playlists." iPod shuffle is based on Apple's incredibly popular shuffle feature, which randomly selects songs from your music library. And now, when you can't remember the name of a song or an artist playing, with the press of a button iPod shuffle tells you the name of the song and artist. iPod shuffle can even tell you status information, such as battery life. With the ability to hold up to 1,000 songs and the VoiceOver feature, you can now easily switch between multiple playlists on your iPod shuffle. iPod shuffle can speak 14 languages including English, Czech, Dutch, French, German, Greek, Italian, Japanese, Mandarin Chinese, Polish, Portuguese, Spanish, Swedish and Turkish. The third generation 4GB iPod shuffle is now shipping and comes in silver or black for a suggested price of $79 (US) through the Apple Store® (www.apple.com), Apple's retail stores and Apple Authorized Resellers. iPod shuffle comes with the Apple Earphones with Remote and the iPod shuffle USB cable. iPod shuffle requires a Mac® with a USB 2.0 port, Mac OS® X v10.4.11 or later and iTunes® 8.1 or later; or a Windows PC with a USB 2.0 port and Windows Vista, Windows XP Home or Professional (Service Pack 3) or later and iTunes 8.1. *Battery life and number of charge cycles vary by use and settings. Seewww.apple.com/batteries for more information. Song capacity is based on four minutes per song and 128-Kbps AAC encoding; in 256-Kbps AAC format, song capacity is up to 500 songs; actual capacity varies by encoding method and bit rate.